Consistent and predictable results every time, these pots are just waiting to fill your garden with colour. Quick and easy - the perfect solution for fabulous garden colour - just place the outside and watch them grow! We’ve done all the work for you – pre-planted with our pansy 'Matrix' - an unusual mix of multi-layered, frilly blooms. Guaranteed to give you effortless, fabulous colour through the winter and into spring. The metallic planters can be used year after year. 'Matrix' plants are supplied ready planted into a pair of 22cm (9 inch) durable metallic-effect planters. Quick and easy, our pre-planted pots are the perfect solution for gardeners who want perfect displays but don't know where to start. Guaranteed to give you fabulous results, we've done all the work for you - just place then where you want, water them and let them do their thing. Consistent and predictable results every time, these pots are just waiting to fill your garden with colour. Giving you superb displays in your garden through winter and into spring, our ready-made planters will perform consistently - plus you'll have the pots to use again next year! The incredible Pansy 'Matrix Mix' is an exquisite and unusual mixture of multi-layered, frilly flowers, many of which have delicate 'cat's whisker' markings. Something really different for winter colour and interest. 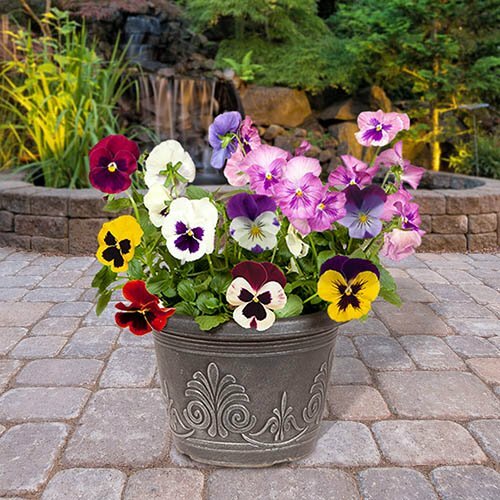 A dazzling array of fruity colours to brighten up your borders and patios, this pansy mix will fill your garden with sweet fragrance; they are long flowering, very hardy and perfect for patio containers and flower beds or borders (plant 15cm apart). Pansy 'Matrix' are compact and will grow to about 15cm (6in) and perform best when placed in full sun or light shade. Our pre-planted pots come straight to you, ready planted with our top quality, UK-grown pansies with no work required! 'Matrix' is supplied ready planted into a pair of 23cm (9in) durable metallic-effect planters. Regular maintenance and watering is essential to grow a fabulous baskets that last the whole season. Deadhead and trim your plants regularly to maintain shape and encourage new flowers. Do not allow plants to set seed. Check and water baskets every day in summer, (unless the compost is wet). Aim to keep the compost moist but not soggy, and avoid wetting the foliage and flowers. From March to June, apply a general purpose liquid fertiliser once a week.